When originally writing the article below in Spring 2018, the mystery remained as to whether or not an Isle of Wight fireman, or more, formed a part of the Overseas Contingent that saw service in Northern Europe. As of this evening 22 January 2019, and thanks to the assistance of a like-minded individual on the mainland, I can confirm that a copy of an original document has been provided to me and the names of the 500 and more men that formed the admired No. 4 Column, does not include anyone from the Isle of Wight. However the article remains as originally written in testament to the Isle of Wight firemen who were willing to go, undertook months of rigorous training, and who, like the majority of the Overseas Contingent, were among the frustrated hundreds that were stood down in December 1944. The photograph above was sent to me by an Island resident in 2017. It came in the form of an attachment to an email that described how the writers father had served with the Auxiliary and National Fire Service's both during and after the Second World War. Initially I assumed the photograph to show a section of soldiers, due to the wearing of berets, at one end of a rope having a bit of a struggle in a tug-of-war competition. Later in the same email the writer advised me that his father served with the Newport Company of the NFS and that he'd attended the attack on Cowes-East Cowes in May 1942 and that prior to that he'd been sent to London for a spell during the Blitz. 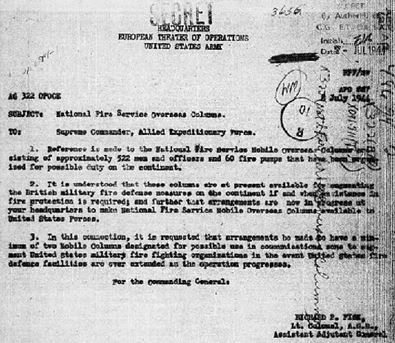 This is not uncommon, I've read plenty about firefighting columns being sent all over the country from less vulnerable areas to the scene of intensive bombing to share the load during the pre-August 1941 period served by the combination of municipal fire brigades and Auxiliary Fire Service. 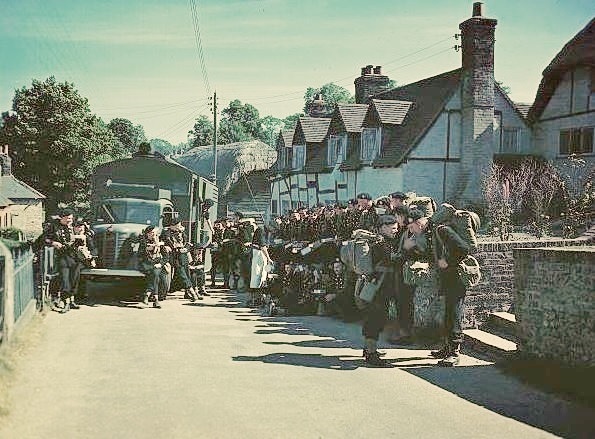 As his father was a member of the AFS, a mobile unit, as opposed to the static municipal brigades, it was not surprising for him to be part of a unit redeployed to London. However later in the email he stated that his father had been conscripted in to the NFS Overseas Detachment. 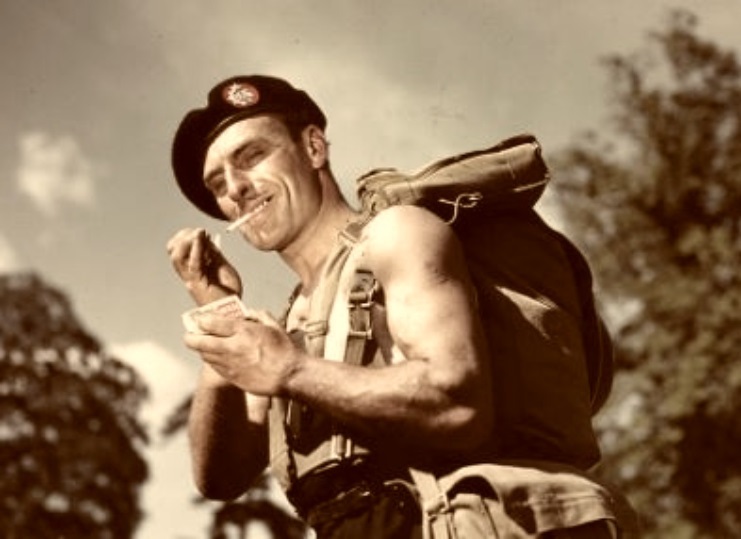 I had never heard of this unit of the NFS before but was immediately hooked by the following description that they were ready to follow the troops into Europe on D-Day. The above photograph was accompanied by the names and even addresses of the men on the rope, five of whom were Isle of Wight addresses (two others being from Leicester and the chap to one side listed as unnamed instructor). This opened up a whole new and exciting avenue of research. The National Archives was the first port of call. Using their online Discovery search engine I was able to locate a reference to a forty-page booklet written by a W.F. Hickin entitled 'Overseas Against Fire'. However the NA didn't hold a copy but made reference to one held by the Second World War Experience Centre in Leeds. A very helpful lady at SWWEC scanned and emailed to me the pages of this booklet. Although brief in nature and poorly reproduced by scanning, the text, author's sketches and grainy photographs opened up to me the world of the NFS Overseas Contingent... who wore military styled berets. 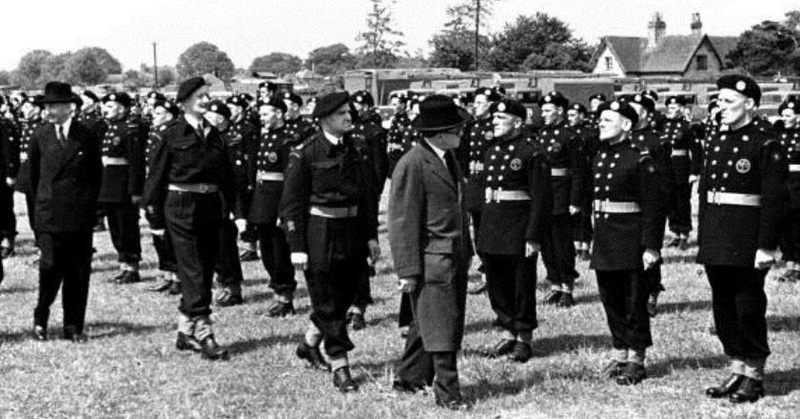 Home Secretary Herbert Morrison inspecting the men of the NFS Overseas Contingent No. 6 Column at Totton on 12 May 1944. No. 6 Column is the unit that Isle of Wight volunteer firemen would have been recruited for. W.F. Hickin's book described in detail that the Overseas Contingent was formed of volunteers (not conscripted as the person who contacted me assumed; this may have been what the chap's father told his mother at the time). Those that volunteered were to be fully qualified firemen of 19 to 45 years of age. Recruitment selection tests were many but above all were to ensure that only the physically most suitable were selected. Five Columns of the Overseas Contingent were formed; No. 4 (East Anglia) Column, No. 5 (London) Column, No. 7 (South Western) Column, No. 12 (South Easten) Column and No. 6 (Southern) Column formed from the men of Region 6 in which the Isle of Wight was Fire Force 14d (this Column also included sections of men from the Corps of Canadian Firefighters). The Overseas Contingent's Columns were to remain under the direction of the Home Office and commanded by officers of the National Fire Service selected with as much rigour as that of the firemen. Their role was to support the advancing armies in the aftermath of D-Day to protect supply lines, fuel depots and pipelines, ammunition depots and armouries, unit headquarters and communication hubs from both accidental fire and those caused by enemy aerial bombardment, artillery or interdiction. Fire prevention and fire protection were the key themes. However none of this would come to fruition until their mobilisation was requested by the War Office, at which point responsibility for the Overseas Contingent would be handed over by the Home Office and the firemen would be subject to the same military discipline as that of the Armed Forces. As volunteers these men were noted for their keeness and enthusiasm to cross the Channel. They threw themselves in to the three key areas of their training; firefighting, honing the skills they already possessed but with adaptations made for the perceived theatre of operations, fitness training and military familiarisation. The latter phase of training was conducted by the Army and involved the NFS firemen engaging in arduous activities on commando lines. It was not unusual for NFS firemen to be seen in the areas of their training centre's engaged in route marches across considerable distances, which for those of No. 6 Column, based at Testwood Schools near Totton, utilised the near limitless breadth of the New Forest. By the time of D-Day, as those at home in all Allied country's waited patiently but anxiously for news, the men of the Overseas Contingent located around the nation waited in excitement and apprehension for the call to come that would transfer them from Home to War Office control and cross the Channel to France. Of relief to the military but of frustration to the Overseas Contingent, it appeared that Germany's anticipated operations against Allied supply lines and depots did not materialise. To many in the military, not wholly convinced that they should be joined by civilian firefighters, this came as a secondary relief. The lack of intensity in the supply areas convinced the War Office that the Army Fire Service had the capacity to handle whatever was being thrown at it. For the firemen of the Overseas Contingent, by a now arguably the best trained firemen in the history of the British Fire Service, capable of military skills of camouflage and concealment and many other functions never to be found in fire service drill books, every day brought disappointment and as news of Allied successes were delivered in succession no call came for them to mobilise and provide the support they so willingly wanted to give. By the winter the Home Office were reconsidering the position, and the cost, of maintaining an Overseas Contingent that it seemed the War Office were increasingly unlikely to call upon. The men were beginning to feel this too and a domino effect ripplied through the Columns with men queing to hand in their lot, asking to be returned to their parent Fire Forces. With the situation not formally unchanged, these men were retained and told they could not be struck off the strength of the Contingent. Dissatisfaction and dissent festered. Ironically it was while a delegation of the Contingent's senior staff were touring Northern Europe to make an appreciation of the situation in preparation for Contingent deployment to Europe, that the Home Office decided to cut their losses. Four of the five Columns were to be disbanded; the keeping of a single Column was seen as something of a token gesture in case the call from the War Office was to suddenly come; which nobody believed would happen. No. 4 (East Anglia) Column was selected to be saved, which may seem odd given that it possessed the highest number of those who had requested to leave. However the Home Office recognised the widespread disappointment and hoped that by retaining No. 4, releasing all of its members that wished to leave, and recruiting from among those still motivated from the disbanded columns, that this single column would remain representative of the spirit in which the endeavour was begun, and of the nation as a whole. Accordingly No. 4 (East Anglia) Column retained its regional title but in reality the men of the East were now heavily diluted by men from the former columns now disbanded and the column was considered a composite unit. At this stage in my research, which lead to many brick walls, I suddenly stumbled upon a source in Portsmouth which delivered a range of photographs. Most of these photographs were of firemen and women from the north-west of the country who were despatched south as reinforcements during the late 1943 initiative known as the Colour Scheme. However a few notable items involved men of the Overseas Contingent in training and a few allegedly showing them on operations in Europe. One in particular caught my eye (below) for its similarity to the image I was given by the son of a potential Isle of Wight Overseas Contingent fireman. 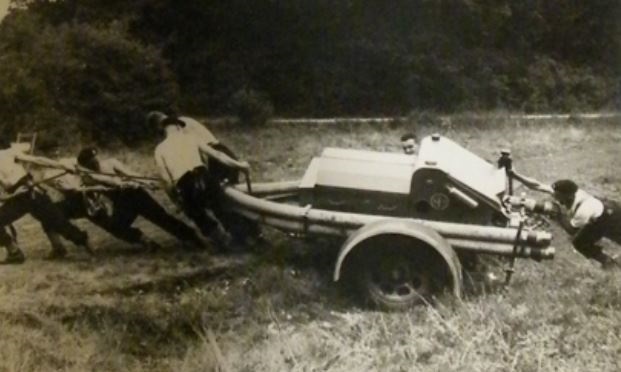 In this image a group of firemen are seen hauling a trailer pump across rough ground, the setting being remarkably similar to what I assumed was the team involved in a tug-of-war. I can't prove it but the similarity of the two photos from completely separate sources is compelling and suggests that the second was also taken in the New Forest as No. 6 Column engaged in arduous training. The similarities are so great that it's plausible that the two photos were taken at the same time and may even have come from the same reel. The two images side-by-side; the initial one on the left is a photocopy of a photograph which probably allows for the difference in quality, but the similarities in every other respect are substantial. No. 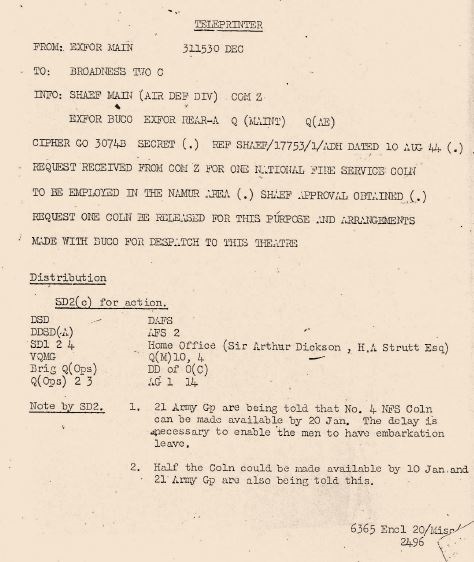 4 Column were eventually deployed to Europe in January 1945, but not initially in support of the British Army, it was the Americans, in the form of their 12th Army Group, who requested their assistance. A confident looking NFS Overseas Contingent fireman takes a smoke break between commando training. On receipt of the mobilisation order an Advance Party was immediately despatched to the Continent. On Thursday 25 January four Companies of the Column embarked Tank Landing Ships at Tilbury, laid off the coast of Essex for three days due to bad weather and finally disembarked during the afternoon and evening of Sunday 28 January and made their way to a transit camp near Ostend, Belgium. The fifth Company, delayed due to a fault with the Tank Landing Ship they'd been designated, arrived the following day. The fascinating story of the Column's work in the final months of the war may feature in a future IWFBF publication. The striking matter is that it was only when reading the passages of W.F. Hickin's account for a second time that I noticed something significant. Once the Overseas Contingent was mobilised and in service with the Americans, they were known as the Overseas Detachment. This is the same phrase that the late fireman and resident of the Isle of Wight had used when describing his service to his son many years after the war. The use of the adjective Detachment I had discounted very early in my research after discovering the proper title of Contingent. I assumed that the father of the man who wrote to me had, many years later, forgotten the correct terminology and I thought little of it. However it provides the tantalising possibility that if he really was a member, not only of the Overseas Contingent but of the Overseas Detachment, then he may have seen service as a fireman near the frontline. Photos of the Overseas Contingent are rare, even more so those taken in colour. This image taken of an unknown Column at an unknown location, features NFS Overseas Contingent firemen with heavy loads during a training route march.